Jon Bon Jovi certainly has some power ballads in his oeuvre that are suitable (read: schmaltzy enough) for a wedding singer’s repertoire. Even receptions for couples who don’t dress in matching stone-washed denim tuxedoes have probably featured a performance of “I’ll Be There For You,” “Always,” or even “Diamond Ring”. He probably never expected to perform at one himself, but that’s just what happened at a recent Miami wedding attended by the erstwhile Bon Jovi frontman and current DirecTV crooner. 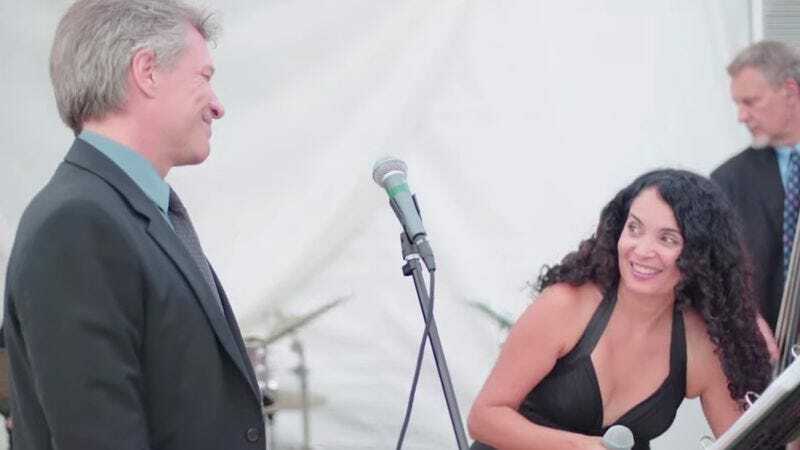 To celebrate the nuptials of “Jennifer and Charlie,” Florida-based musician and wedding singer Lourdes Valentin decided to channel her inner Jersey girl, and started singing “Livin’ On A Prayer.” (Which was an odd choice, because despite the rousing chorus, the lyrics basically describe living hand to mouth, but we digress.) According to Stereogum, Valentin didn’t just spring the tune on Bon Jovi; she had approached him earlier, but he declined. But Valentin—who was perhaps worried that Jennifer and Charlie’s marriage wouldn’t “take” if she failed to net the duet—was undeterred, and sang in Bon Jovi’s alternately grinning and grimacing face until he relented. (Maybe he wasn’t thrilled that she kept changing the words to “take my hand and we’ll take it, I swear.”) So they sang the song together, and even though he hadn’t had the chance to warm up, Bon Jovi acquitted himself nicely. But he’s probably wishing the next wedding he attends has a DJ—that, or he’ll suggest performing “Let’s Make It Baby” instead.